于冬梅, 琚腊红, 赵丽云, 房红芸, 杨振宇, 郭海军, 于文涛, 贾凤梅, 赵文华. Yu Dongmei, Ju Lahong, Zhao Liyun, Fang Hongyun, Yang Zhenyu, Guo Haijun, Yu Wentao, Jia Fengmei, Zhao Wenhua. Yu Dongmei, Ju Lahong, Zhao Liyun, Fang Hongyun, Yang Zhenyu, Guo Haijun, Yu Wentao, Jia Fengmei, Zhao Wenhua. 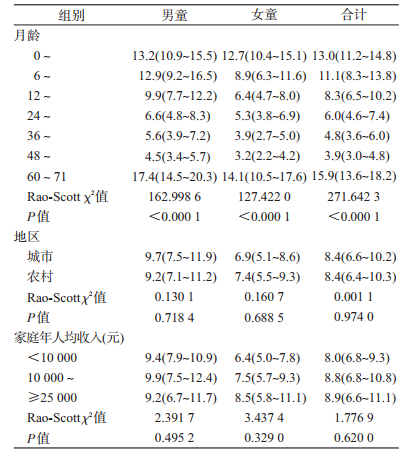 Prevalence and characteristics of overweight and obesity in Chinese children aged 0-5 years[J]. 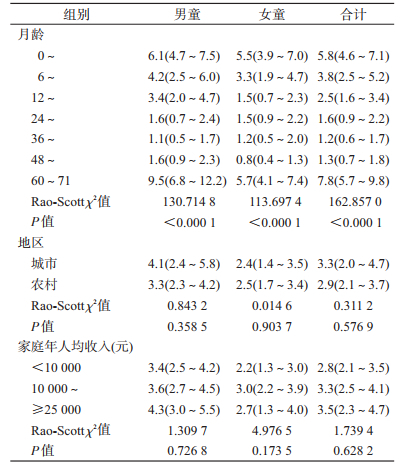 Chinese Journal of Epidemiology, 2018, 39(6): 710-714. Abstract: Objective To study the prevalence and characteristics of overweight and obesity among Chinese children aged 0-5 years, in 2010-2013. Methods Data was from the' China Nutrition and Health Surveillance-0-5-Years-Old Children and Lactating Women' project in 2013. Stratified multistage cluster sampling method was used to select 55 districts/counties from 30 provinces (autonomous regions, municipalities) with the sample size of children as 32 862. Definition of overweight and obesity were according to both the WHO 2006 growth standard in children less than 5-year-old and the WHO 2007 growth reference in children of 5 -years-old.Results were calculated by complex weight based on national census from the National Bureau of Statistics in 2010. Results The overall prevalence of overweight was 8.4% among the 0-5-year-old in 2013, with 9.4% in boys and 7.2% in girls. Both of the rates from urban and rural areas were the same, as 8.4%. The prevalence rates of overweight in the 0-, 6-, 12-, 24-, 36-, 48-and 60-71 months age groups appeared as 13.0%, 11.1%, 8.3%, 6.0%, 4.8%, 3.9% and 15.9%, respectively. The rates of overweight in low, medium and high income families were 8.0%, 8.8% and 8.9%, respectively. The prevalence of obesity was 3.1% among the 0-5-year-old, with 3.6% in boys and 2.5% in girls. There was no significant difference seen in urban (3.3%) and rural areas (2.9%). The prevalence rates for obesity in the 0-, 6-, 12-, 24-, 36-, 48-and 60-71 months age groups were 5.8%, 3.8%, 2.5%, 1.6%, 1.2%, 1.3% and 7.8%, respectively. The rates of obesity in low, medium and high income families were 2.8%, 3.3% and 3.5%, respectively. Conclusion The prevalence rates of both overweight and obesity were increasing among the 0-5-year-olds in China, suggesting that it is necessary to timely conduct the surveillance and intervention programs on overweight and obesity in this target population. World Health Organization.Global nutrition targets 2025:childhood overweight policy brief[M]. Geneva: World Health Organization, 2014. Chang JL, Wang Y.Comprehensive report of China nutrition and health surveillance 2010-2013[M]. Beijing: Peking University Medical Press, 2016. 国家卫生计生委疾病预防控制局. 中国居民营养与慢性病状况报告(2015年)[M]. 北京: 人民卫生出版社, 2016. Disease Control and Prevention, National Population and Family Planning Commission.Report of China nutrition and chronic diseases in 2015[M]. Beijing: People's Medical Publishing House, 2016. 李廷玉. 中国儿童营养面临的双重负担——营养不良和超重肥胖[J]. 中国实用儿科杂志, 2015, 30(12): 881–883. Li TY. Dual burden facing Chinese children:malnutrition and overweight or obesity[J]. Chin J Pract Pediatr, 2015, 30(12): 881–883. Ulger Z, Demir E, Tanaç R, et al. The effect of childhood obesity on respiratory function tests and airway hyperresponsiveness[J]. Turk J Pediatr, 2006, 48(1): 43–50. Commission on Ending Childhood Obesity. Report of the commission on ending childhood obesity[EB/OL]. (2016-01-25)[2017-10-11]. http://www.indiaenvironmentportal.org.in/content/424352/report-of-the-commission-on-ending-childhood-obesity/. 陈玉霞, 麦锦城, 吴汉荣. 超重肥胖对儿童青少年生活质量的影响[J]. 中国学校卫生, 2010, 31(5): 522–523, 525. 陈春明. 对儿童肥胖问题的防治不可坐失良机[J]. 中华流行病学杂志, 2004, 25(2): 95–96. 中华人民共和国卫生部. 中国0-6岁儿童营养发展报告(2012)[R]. 北京: 中华人民共和国卫生部, 2012. Ministry of Health, China. 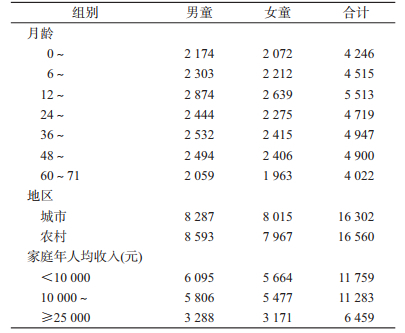 The report of nutrition and development in 0-6 years old children in China(2012))[R]. Beijing: Ministry of Health, China, 2012.